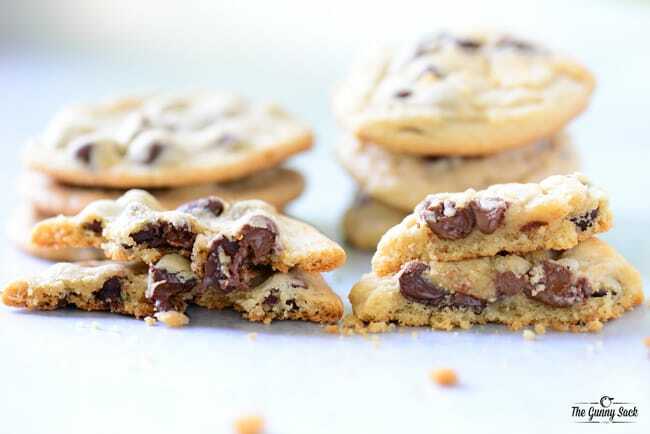 Our favorite Chocolate Chip Cookies are chewy, gooey and slightly crisp on the outside. 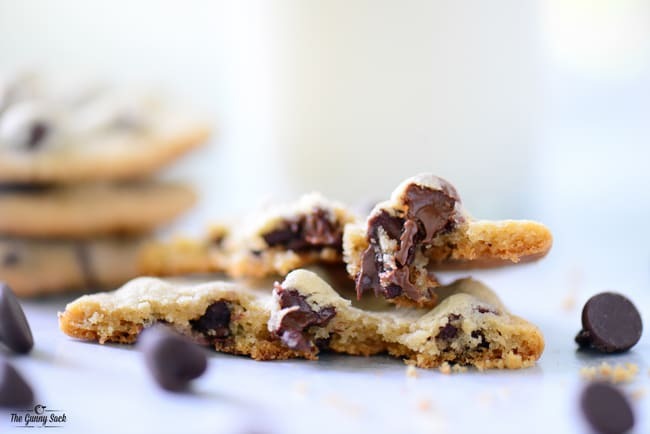 This easy recipe results in flatter cookies that taste amazing! What is the one food item that you baked (or cooked) that inspired you to want to continue baking (or cooking)? It might be something you made when you were a kid or if could be something you learned to make last week. What about that particular recipe was so inspiring? Maybe it was how perfectly the food turned out or was it that you enjoyed the delighted reaction of your family and friends. For me, that food item is chocolate chip cookies! I’ve been making them for so long that I don’t even remember when I started. I loved how the cookies turned out and I really enjoyed how much everyone else loved my cookies. My favorite chocolate chip cookie recipe is from the vintage, orange Betty Crocker cookbook. 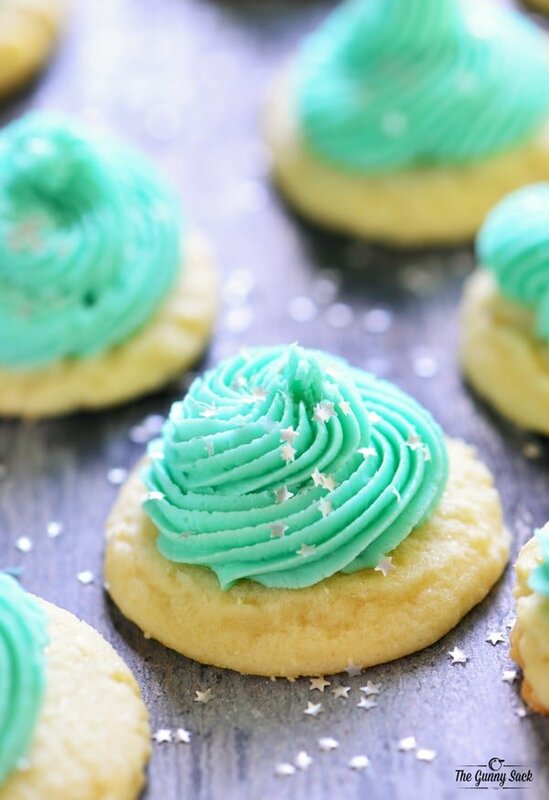 Disclaimer: Please note that some of the links in this post are affiliate links to some of the tools used to make these cookies. There is no additional cost to you, but I will earn a small commission if you purchase through those links. I needed to make chocolate chip cookies for a blog post that I will be sharing next week and decided to tweak my favorite chocolate chip cookie recipe a bit to make it my own. 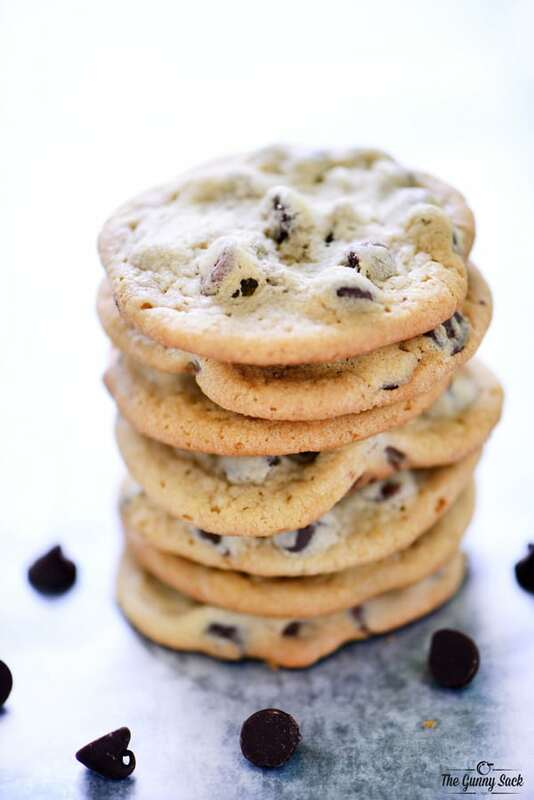 Before getting started with the recipe, I want to talk a little about chocolate chip cookies because everyone has their own favorite and that is part of what makes the world so amazing. My favorite chocolate chip cookies are chewy, gooey and slightly crisp on the outside like the ones pictured on the left in the photo above. The cookies on the right are softer, slightly drier and more cakey. The only difference between the two recipes is the amount of flour. 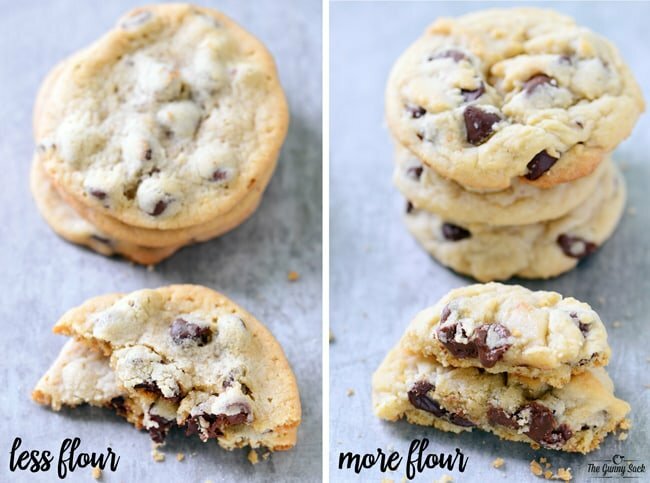 The chocolate chip cookies on the right have 1/4 cup more flour than the ones on the left. 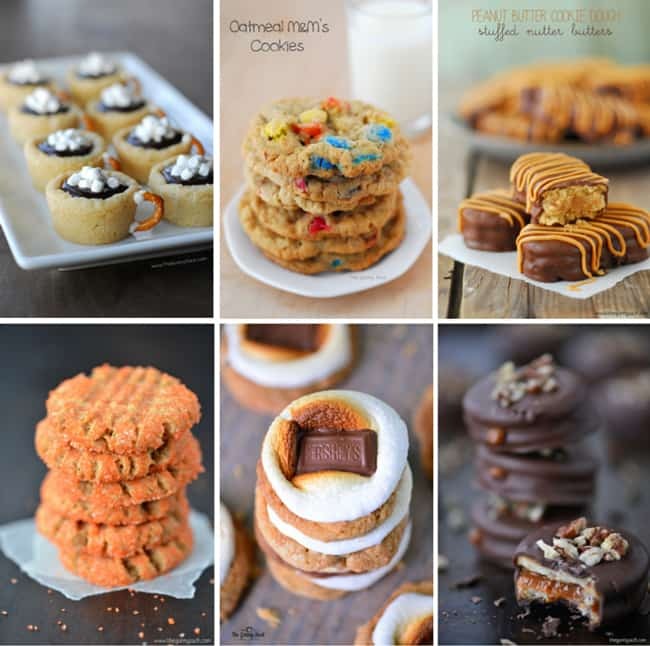 The “puffier” cookies on the right LOOK more perfect but the “flatter” cookies on the left TASTE perfect! 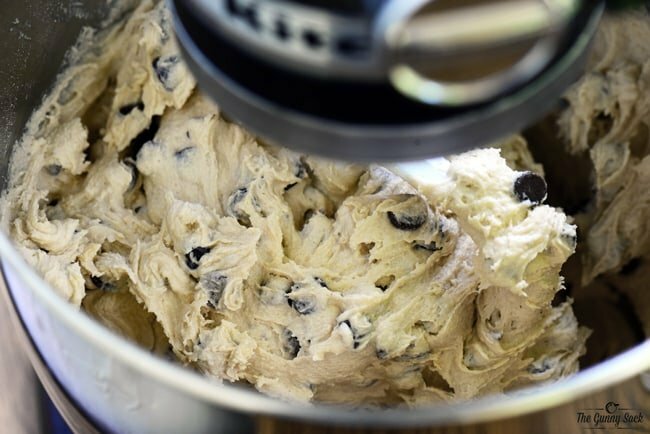 Make the chocolate chip cookie dough in a large stand mixer. 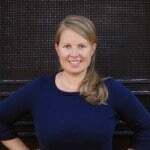 I love using my KitchenAid mixer (affiliate link). 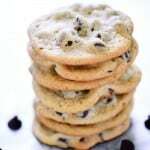 The dough for my ideal chocolate chip cookies is a stickier dough because it has slightly less flour. After making the dough, use a cookie dough scoop (about 1 1/2 tablespoons size) (affiliate link) to make even balls of dough. Place them on baking sheets with at least 2 inches between them. Bake the cookies for 9-11 minutes at 375 degrees. I like to remove them when the cookies are starting to turn golden brown around the edges but are still slightly jiggly on the top. 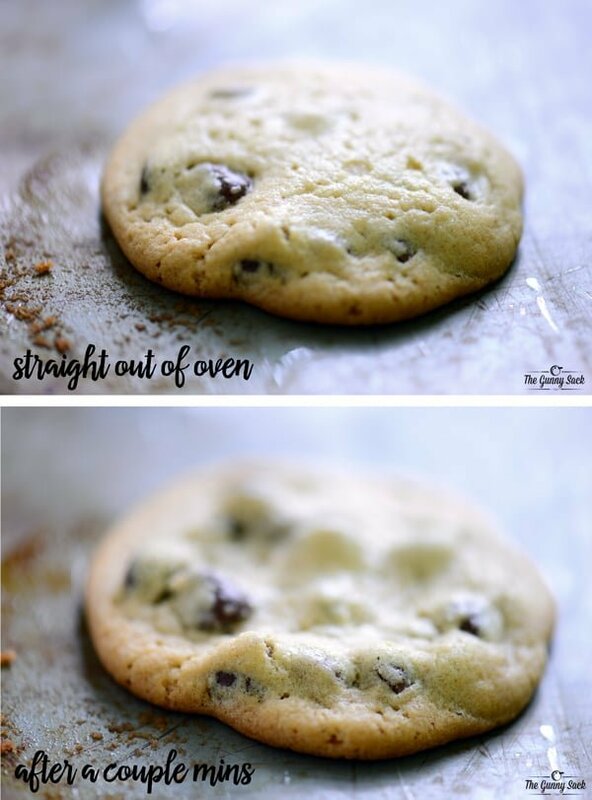 When I pulled my cookies out of the oven, they were puffy, like the picture on top in the image above, and after a couple of minutes of cooling they flattened like the bottom image. Allow the cookies to set and cool slightly on the pan before transferring them to a wire rack or a piece of parchment paper to cool completely. 1. Give the oven plenty of time to heat. Once it reaches 375 degrees and let it sit at the temp for several minutes before adding cookies. 2. The butter should be softened slightly but not too soft or melted. 3. Use a cookie dough scoop (affiliate link) to make even balls of dough so that the cookies can bake evenly. 4. Leave at least 2 inches between the balls of dough on the baking sheet so that the cookies have enough space to spread. 5. Set a timer (which may seem obvious but one of my BFFs doesn’t like to use timers and often burns things) to the lowest time, check the cookies and then continue baking if necessary. 6. Allow the cookies the set and cool on the pan before removing them to cool completely. 7. Allow the BAKING SHEET to cool completely before adding more cookie dough to it. You can stick the baking sheet in the fridge for a couple of minutes to help it cool faster. 8. Store the cookies in a covered container for up to three days at room temp. 9. Store the cookies in freezer bags or containers for up to three months in the freezer. I shared both versions of the chocolate chips cookies with my family (the ones with more flour and the ones with less) and everyone agreed that these are our FAVORITE chocolate chip cookies! My family’s favorite way to eat them in with a glass of cold milk. In a large stand mixer, combine butter and shortening. Cream in the sugars until light in color and fluffier in texture about 2-3 minutes. Stir in the semi-sweet and milk chocolate chips. Use a cookie dough scoop (about 1 1/2 tablespoons size) to make even balls of dough and place them on baking sheets with at least 2 inches between them. Bake the cookies for 9-11 minutes at 375 degrees. Recipe adapted from the vintage Betty Crocker cookbook. these look super good I’m about to make them right now! this is exactly the recipe i need! chewy but slightly crunchy sounds amazing! Thanks Ambar! I hope you enjoy them as much as we do! 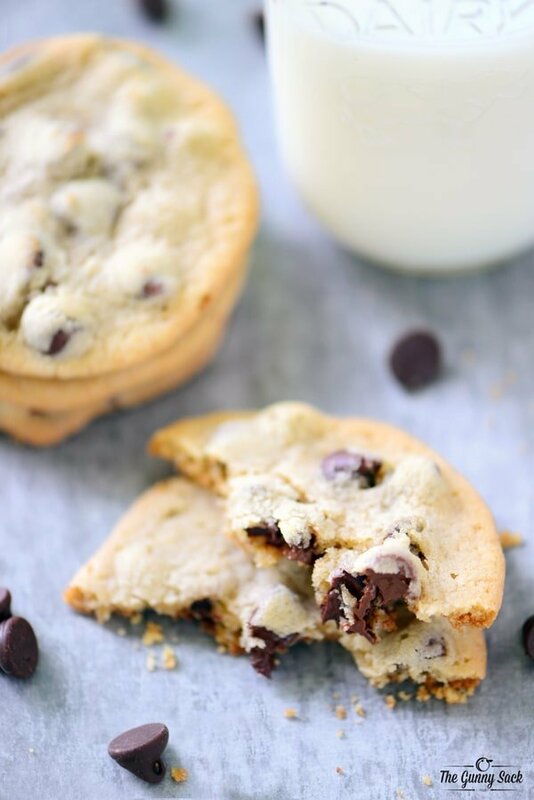 It doesn’t get much better than a good chocolate chip cookie! Crispy on the outside and chewy on the inside is the best! You got it! Thanks Jessica! Yep….they are also my all time favorite. Although my boys seem to make better choc chip cookies then I ever could…go figure. Maybe if I try this recipe…I can show up Jason and Jeff and have better cookies than they make. lol Thanks for sharing. Yeah, fresh out of the oven chocolate chip cookies can tempt me like none other! What recipe do the boys use? SOUND WONDERFUL WILL GIVE THE A TRY.